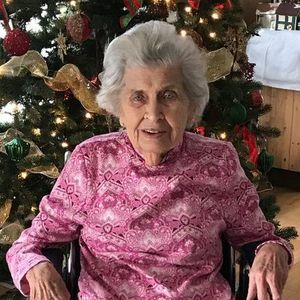 Mildred "Mickey" Cordes Nye of Elizabethtown passed away on Thursday, December 13, 2018. She was preceded in death by her husband David Nye Jr., one daughter: Lyda Grey and her brother Auby Bush. She is survived by two sons Dennis and Mike; two daughters: Sherry Melvin and husband Edward, Janice Robbins and husband Chicky, all of Elizabethtown. Mrs. Nye had eight grandchildren: Byron Melvin, III, Elizabeth Eubanks (Austin), Kyle Melvin (Hillary), Ivey Robbins, David Melvin, Nicole Allen (Jared), Whitney Inman (Mikey) and Katie Nye. She also had six great grandchildren: Camryn, Trace and McRay Eubanks, Addison Melvin, Lucy Inman and Noah Allen. Mickey grew up in the Carver's Creek community where she attended grade school. She graduated from Elizabethtown High School and attended East Carolina University. She was an avid volunteer in community activities including church, schools, Girl Scouts, Meals on Wheels, and Bladen County Hospital. She served as a "Pink Lady" for 39 years in the hospital. The family will receive friends on Friday, December 14, 2018 from 6-8 pm at Bladen Gaskins Funeral Home in Elizabethtown. A funeral service will be held on Saturday, December 15, 2018 at 2 pm at Trinity United Methodist Church with Rev. Jay Winston officiating. Burial will follow the services in Carvers Creek United Methodist Church Cemetery. In lieu of flowers, memorials may be sent to Carvers Creek Methodist Church c/o Brenda Marshall, P.O. Box 98 Council, NC 28434 or Trinity United Methodist Church, P.O. Box 759, Elizabethtown, NC 28337. Add your thoughts, prayers or a condolence to Mildred 's guestbook.